[Raphael Abrams] does a lot of freelance work, but he has trouble accurately keeping track of the hours he has put in for his clients. After trying various applications and methods of logging his time, he finally decided to build a device that worked just the way he liked. He calls his device the “Freelance Puncher”, though it already has been nicknamed the detonator, as it looks like something you would find in the hands of a [James Bond] villain. The device uses a PIC16LF1827 to track the time, saving his logged hours to the built-in EEPROM when powered off. A pair of 7-segment displays are used to display the accumulated hours upon power-on, and a set of seven SMT LEDs separated into two banks keep track of quarter and hundreds of hours worked. [Raphael] has made his code and schematics available on Github, so you can easily replicate his work if you are looking for a better way to track your time. We think it looks great, though it could be the sort of thing that traveling freelancers might want to keep in their checked luggage, unless they want to spend some quality time with the TSA! Be sure to stick around to see a short video where [Raphael] shows off and explains how his Freelance Puncher works. [JD] at isotope11 was looking for a way to get instant feedback whenever a developer broke a piece of software they were working on. 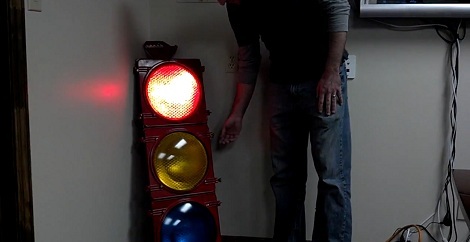 After finding a 48 inch tall traffic light, he knew what he had to do. Now, the entire development team knows the status of their code from a traffic light hanging in the corner. isotope11 runs a continuous integration server to do the quality assurance on their software projects. It’s a lot more flexible than the ‘compile and pray’ setup we’re used to, but then again C isn’t very well suited to test-driven development. When one of [JD]’s developers breaks a piece of code, the CI server will send a warning to an Arduino where all the electronic magic happens. To light the traffic light, [JD] used a few relays to drive the 120 volt bulbs in the traffic light. The traffic light is very easy to read – red means something is broken, green means everything is alright, and yellow means a test suite is being run. Check out the video of [JD]’s TDD visualization after the break. [Petros] sent in this video of his visualization of Van Gogh’s Starry Night. He did this with openFrameworks and also made a version that reacts to sound. Is anyone else reminded of that one scene in Vincent and the Doctor? [Rick] wanted to build a lock pick training station for the Eugene Maker Space, but he needed a way to make it interesting. What could be better than a mystery box? When you pick the deadbolt, open the box up and you’ll get a prize. Just make sure you put something of yours in the box for the next person. Because the 3d printer community isn’t segmented enough, [Sublime] decided to design a new one. Here’s where it gets cool: the Tantillus can print its own case, and can ‘daisy chain’ to another Tantillus so only one set of electronics are needed. Interesting ideas afoot. Valentine’s Day is coming up, so if you haven’t already made dinner reservations, you’re probably up the creek. How about making a duct tape rose for that special person in your life. Bonus: a dozen costs $3, and they won’t die in a week. [Leniwiec] sent in a tutorial on connecting keypads to a microcontroller with a serial or SPI interface. 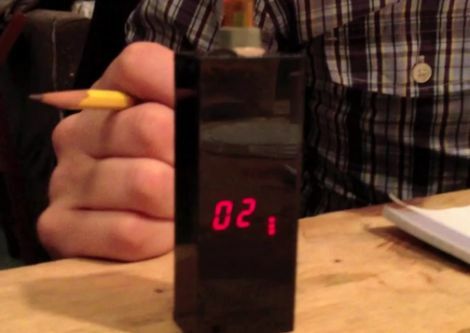 If you want to build a calculator, this is your chance. We’d use this for an Apollo Guidance Computer, though.